End of Year One Word Gift | My Attempts at Being Creative! WOW! Is all I can say. Thank you to everyone who has viewed and liked this post. It is by far my MOST POPULAR post ever. I have had quite a few questions about my end of the year gifts and have created a little FAQ to try and help people out. Check it out here. For the end of the school year gift to my students I created these Tagul inspired pictures for them. Have you used Tagul before? If not, check it out. I had each student in my class say one nice thing about each student in our classroom. After I collected all the responses I put them all in Tagul and chose to design stars for the boys and hearts for the girls. I made their name the largest and then also the grade and school larger than the rest of the words so they stood out. The kids loved them and I had a parent tell me at the beginning of this year that her son still has his hanging on his bedroom wall!!! Melts my heart! Great idea! How did you get the background color behind the shape to stay white but color the rest of the perimeter in? After I create the image and press the visualize button I right-click save image as… Then I put it into a word document and print it like that. I cut out the Wordle and mount it on a piece of scrapbook paper. Does that make sense? i love this, i am going to do this for our Primary 7 prom i am organising in UK. just out of curiosity what have you put on the bottom corner of each one? I just put the title One Word from the kids in Room 208 on a sticker and put it in the bottom corner. I get the frames from The Dollar Tree and the matting is just cardstock from Hobby Lobby. I get the document frames so that a standard size piece of cardstock fits in the frame. OK, so this Tagul website is not the most user friendly for a first timer! 🙂 How do you get the words in different colors?! I’m exhausted! It is time consuming! I’m sure there is probably a simpler website. If I remember correctly under the color tab if you press it a color wheel will come up and and choose your color. I usually just go in a row and have the same color for the first 4 words, a new color for the next four words and so on until I get them all on there. 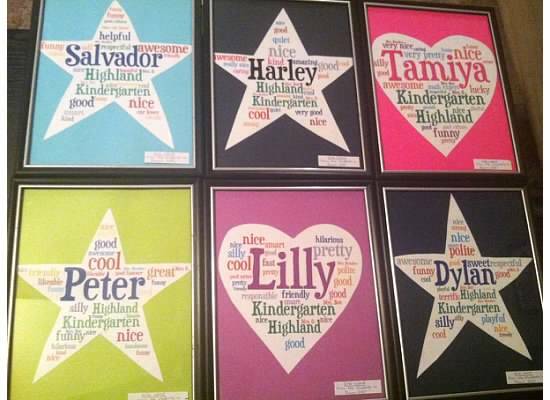 I put the kids name in one color (usually their favorite color), school and grade in another color. Hope this makes sense. That is such an AWESOME idea!!! I LOVE it!!! Could you tell me what website you go to? Is it free, or how much does it cost to use? Thanks so much for sharing! Thanks! I use http://www.tagul.com. It is free! Is that an app? How can I create such a wonderful thing? I do not use an app. I just use the free website. Go to http://www.tagul.com. It might take a little bit to get things like you want and it is time consuming. There is probably an easier way to create them than this but it’s what I used and will use again this year! This is fantastic! I am going to build these for my Grade 5 students. Thank you for the idea! I tried it, and I love it, but I need to find a way to speed up the printing. Each word cloud took between 4 and 12 minutes to print! Is that what happened for you, too? After I created them I copied the images and put them all into a word document. I just printed normally from there and it did not take a long time. What does the writing on the lower right hand corner say? Thanks. These are great!! Can you tell me how you were able to line up the name a grade? I can’t figure it out to save my life. I can get the name straight, but not the grade. Honestly, I don’t have a special way to do it. The only thing I can think of is that I change the size of each thing. I haven’t done them yet this year (we don’t get out until the beginning of June) but I’m pretty sure I set the name at 4, school and grade at 3, teachers names at 2 and the rest at 1. I’m not sure that helps you at all though. Trackback: UPDATED- One Word End of the Year gift | My Attempts at Being Creative! I love this idea! I’m going to try it for my kiddos. How did you select on the websit just a heart and star I tried to do a heart but it’s like a double heart instead of just one. I’m pretty sure it was an option on the shapes tab. I’m not by my computer right now but plan on working on mine tonight. I will get back to you. The hearts that I normally use are the ones that are offered on the top row when you select shapes. One is the red heart and the blue one right next to it. I just tried it and it worked for me. How do you get the shape to be white? I have tried everything!! I just saved it as a png image sq to my documents and then opened it up in word. Make sure on the colors and animation tab the background color is set to white. Hope this helps! I can’t get mine to save into a word doc! I have no idea what I’m doing wrong! I got mine to save to a word document but it was very blurry so I just went ahead and purchased the 5HQ image pack for $10. It was worth it for me since I didn’t need very many. Thank you for sharing this great idea! What font and size do you use? For the font I usually let it surprise me. I will change it if it turns out to be a cursive font. For size I put the student name in 4, the school and grade in a size 3, the teacher(s) in a size 2 and all the adjectives in a size 1. Are you a member of the site? Did you pay per print or is there a way around it?